We have listed 101 most common dog breeds in Australia. Learn about all the important characteristics in each breed, (they all different to each other) origin, temperament, history, potential health related issues and interesting facts about them, Read about small to medium or large dog breeds from this A – Z list. Let us know if we missing any profile. The Labrador Retriever, regularly tops the charts as the most popular dog breed in many countries around the world, including Australia. It is easy to see why, with their pleasant and kind temperament yet outgoing and loyal nature. They are often referred to as the perfect mix of being a great family dog yet an intelligent and focused working dog too. They are used as assistance dogs for the visually impaired and autistic, as well as in law enforcement, and search& rescue. However, don’t let the relaxed temperament fool you, these dogs need a lot exercise and stimulation, often having lots of puppy-like energy up until at least three years of age. They suit a more energetic family, who can offer at least one or two long walks a day, with more at the weekend. Officially they are a medium-large dog, usually weighing around 30kg when fully grown, and their short dense coat comes in three main colors; yellow, black and chocolate. Due to their love of food, without enough exercise they are prone to putting on weight. Many Labradors would eat all day if they could, but feeding this breed an appropriate diet should cost around $40-60/month. 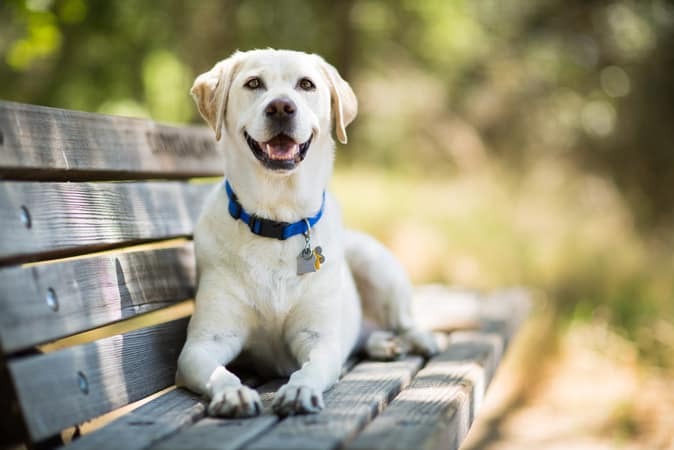 On average Labradors live to around 12 years old and common health problems include obesity, hip and elbow dysplasia, ear infections and allergic skin disease. Fun Fact…It’s ancestors, known as St. John’s water dogs, originate from Newfoundland, Canada, where they helped fishermen. Despite their tough appearance, Staffordshire Bull Terriers are actually sweet tempered, gentle and fun loving. This medium sized dog, generally lives over 12 years and weighs around 15kg when fully grown. On average, food for this breed costs around $25-35/month. Although this energetic breed loves and craves human attention, they can sometimes be defensive towards other dogs that they do not know. Therefore, they need an owner who is loving yet firm and who has the time to give them daily exercise and training. They have a short, easy to care for coat, that can have a wide variety of colors including red, fawn, white, black, blue or brindle,with or without white. 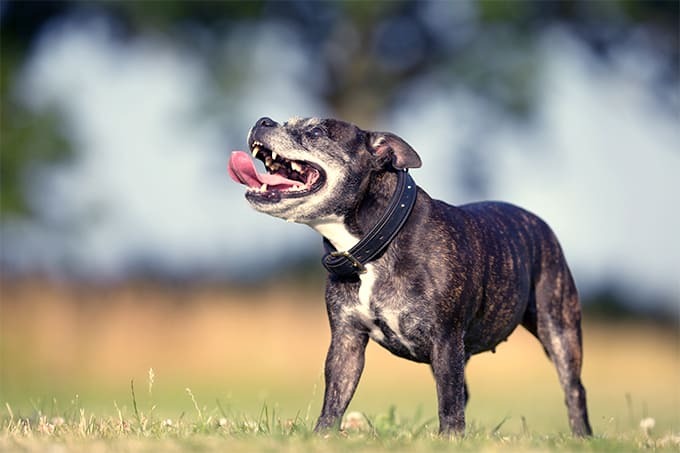 Although the Staffordshire Bull Terrier is a robust and healthy type, there are some health problems associated with this breed, including juvenile cataracts, skin allergies and hip dysplasia. 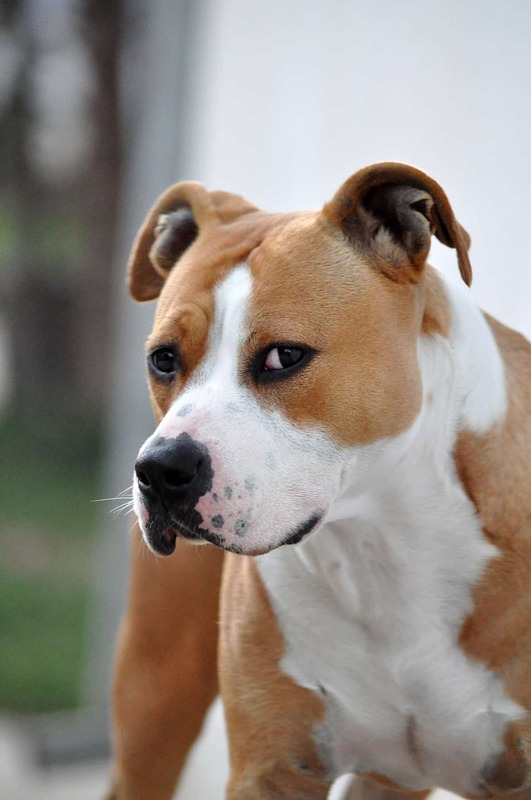 Fun fact…They are commonly referred to as “Staffies”. The French Bulldog, also known as the Frenchie, is a small yet muscular breed with distinctive large “bat” ears. They are friendly, easy going and playful, and they love getting lots of attention. Although they love to play, they can also like a relaxed lifestyle, often preferring the sofa over a run in the park. They are perfect for city living, as they will be quite happy in an apartment and don’t require a large back yard. However, they still need a short walk daily and some playtime to keep them in shape. They have a life expectancy of 10-12 years, and adults don’t weigh more than 12kg. Unfortunately, like all brachycephalic dog breeds (those with short noses and flat faces) they are prone to breathing problems, especially in hot weather. Other health problems they are prone to include cherry eye, juvenile cataracts, entropion and skin allergies. 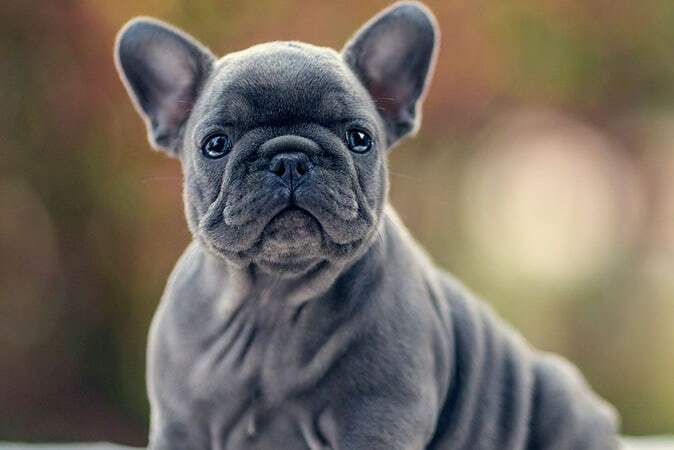 Generally, feeding a Frenchie is about $20-30/month, but these little dogs can easily become overweight, so its best to hold back on the treats. Fun fact…Due to theirfront-heavy structure, Frenchies are not good swimmers at all, and should not be left unattended near a bath, pool or river. The German Shepherd, also commonly known as the Alsatian, is known for it’s intelligence, bravery and fierce loyalty. They are extremely versatile and are trained for many different roles including shepherding, police and military service, search and rescue, guarding and competitive agility. This breed is extremely active and needs to be kept busy with regular exercise and training to keep their mind stimulated. Due to their loyal and loving nature they make great family dogs, but can be protective of their loved ones and suspicious of strangers, hence why they also make great guard dogs. This large breed dog has a life expectancy of around 9-13 years and adults weigh in the range of 30-40kg. Feeding a German Shepherd could cost you around $50-70/month. They are predisposed to certain health conditions including bloat (gastric dilatation volvulus), hip dysplasia, elbow dysplasia, degenerative myelopathy and exocrine pancreatic insufficiency. Fun Fact…They have a double coat which helps keep them warm and dry. The outer coat sheds year round. The Border Collie is an athletic, medium-sized dog (15-20kg) with long hair. 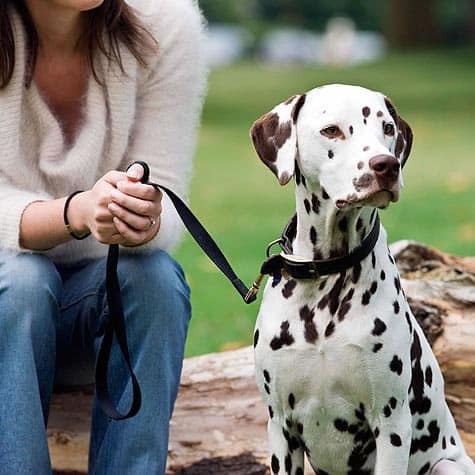 They can have a rough or smooth coat, and although black and white is the most common colour, the breed actually has a wide variety of colours and patterns. Originally bred for herding sheep in Scotland, these dogs are intelligent, hard working, quick and agile, with seemingly endless supplies of energy. They need dedicated owners and a lot of exercise, and thrive when they are given a job to do such as herding, or competitive obedience and agility. Being extremely eager to please they form a strong and loving bond with their owner, but can sometimes be suspicious or reserved with strangers. This breed needs a high energy diet to keep up with their activity levels, and average food costs are around $25-30/month. 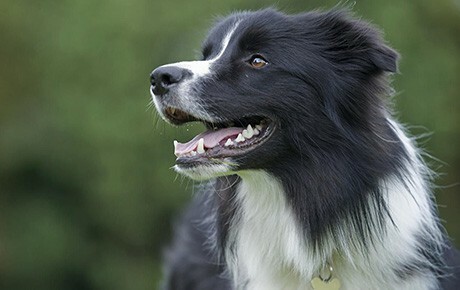 On average, they have a life expectancy of 12 years, and certain health problems the breed are prone to include epilepsy, collie eye anomaly and deafness. 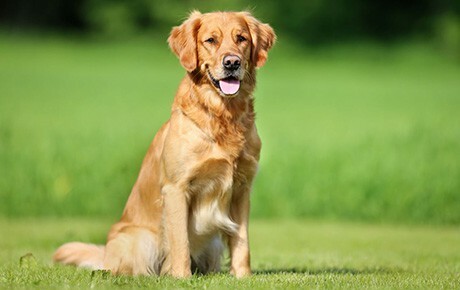 The Golden Retriever is a medium-large sized dog, well known for their long and dense golden coat. They are intelligent, eager-to-please and friendly, and make great family dogs. Originally bred as a gundog to retrieve birds, these dogs also excel as guide dogs for the blind, search & rescue and in competitive obedience and agility events. They are very energetic and enjoy a lot of exercise (especially swimming) and playtime to burn off excess energy. The average life expectancy for this breed is 12 years old. They are prone to some specific health conditions such as hip dysplasia, elbow dysplasia, certain cancers (hemangiosarcoma), hypothyroidism and epilepsy. Unfortunately, they are also prone to obesity so they need lots of exercise and a suitable diet. Their ideal adult weight is normally around 25-34kg, and feeding a Golden Retriever costs around $40-60/month. Fun Fact.. Former presidents of the USA, Ford and Reagan both had Golden Retrievers as pets while in office. This toy breed, is sweet, gentle and friendly. They have a silky, medium length coat that can come in four main colors. They are very affectionate and love human attention, and are often very friendly with people and other dogs they don’t know too. Although mainly thought of as a lap dog, they do enjoy a regular amount of exercise and playtime. However, they may be just as happy chilling out on the sofa than going for a long walk. The breed is prone to several health issues including mitral valve disease, syringomyelia, eye conditions (cataracts, retinal problems) and patella luxation. They have an average life expectancy of 12-15 years and usually weigh between 6-8kg. On average it costs around $20/month to feed this small breed. 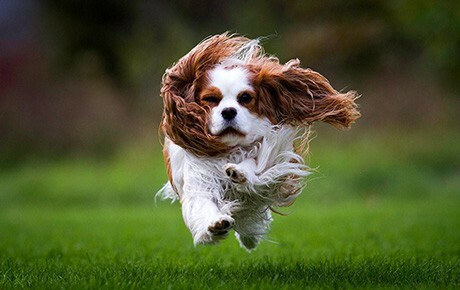 Fun Fact… The Cavalier King Charles Spaniel gets its regal name from King Charles I of Britain, as he was very fond of the small spaniel breed in the 1600s. The American Staffordshire Terrier is a strong and muscular, medium sized breed. They are an intelligent, confident and loyal dog. 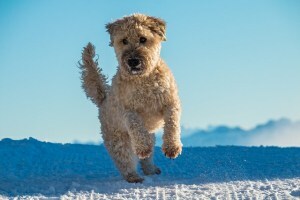 Although they were originally bred to be a fighting dog and can have an intimidating stance, this terrier makes a friendly and good natured companion. They have a short, smooth and easy-to-care for coat, which comes in a wide variety of colours and patterns. They require a lot of exercise, and like being physically and mentally challenged with running, training or games. The normal adult weight is usually between 25-35kg, and on average have a life expectancy of around 12 years. This breed is prone to certain health issues including hip dysplasia, skin allergies, hypothyroidism and cerebellar ataxia. As a guide it could cost around $40-60/month to feed an American Staffordshire Terrier. Fun Fact…The American Staffordshire Terrier, is known to their fans as AmStaffs. There are three recognised Schnauzer breeds: Miniature, Standard and Giant. The Miniature Schnauzer is a small and robust terrier breed, that originates from Germany. They are a lively, outgoing, friendly and often fearless breed. They have a wiry coat that requires regular brushing or trimming and comes in three colours: salt & pepper, black & silver and black. Most owners of Miniature Schnauzers choose to have their dogs regularly clipped by a professional groomer. This bright breed requires daily moderate exercise to keep in shape, and enjoys being part of the family. They have a life expectancy of around 12-15 years and adults generally weigh between 5-8kg. 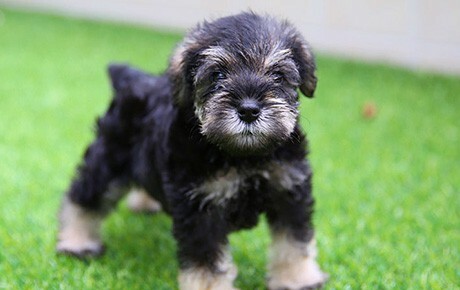 Miniature Schnauzers are prone to some health conditions such as pancreatitis, diabetes and urinary stones. A good quality, balanced diet can help reduce the risk of some of these health conditions, and on average it should cost around $20/month to feed this breed. Fun Fact…Miniature Schnauzers are thought to have come from breeding standard Schnauzers with Poodles and Affenpinschers. The Rottweiler is a powerful, confident and muscular large breed dog. An adult Rottweiler tend to weigh between 40-60kg. Despite their big appearance, they are gentle, friendly and playful within their family. 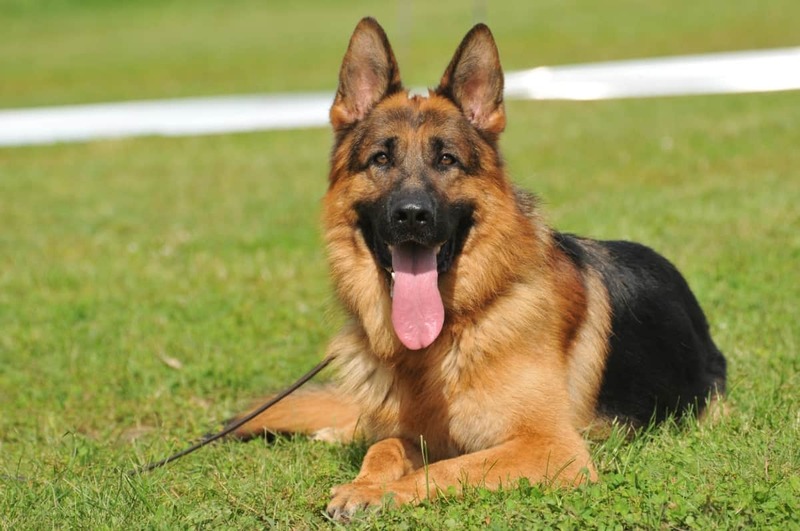 They are also protective, brave, and strong, hence why this breed is often used as a police dog or guard dog. 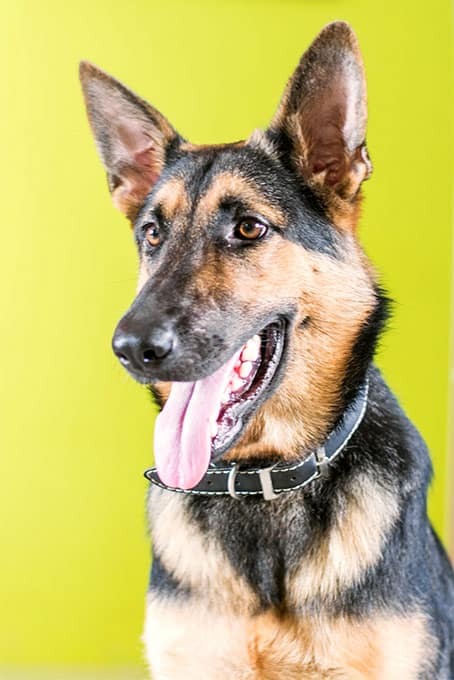 It has a black and tan, thick coat which is easy to care for. The breed needs good socialisation and moderate daily exercise, to help prevent obesity and to keep fit and mentally stimulated. As with many large breed dogs, the Rottweiler is prone to hip dysplasia, elbow dysplasia, bloat (GDV) and dilated cardiomyopathy. Other health problems they are prone to include osteosarcoma and parvovirus. On average this breed has a life expectancy of 8-10 years. Feeding a Rottweiler generally costs around $50-70/month. 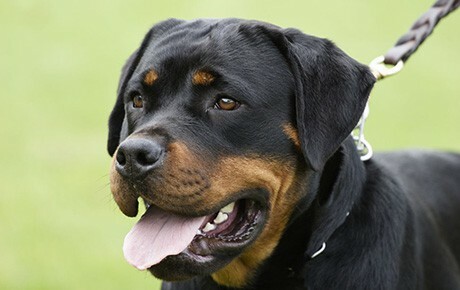 Fun Fact…The Rottweiler is thought to descend from the Mastiff dogs from Roman times. NOTE: Every dog needs a good quality, complete and nutritionally balanced diet. How much they eat depends on their breed, size and activity level. The overall cost of dog food also depends on what food brand you buy and if your dog needs a specific diet (e.g. low calorie, dental food or hypoallergenic food). The food costs listed are an estimate. 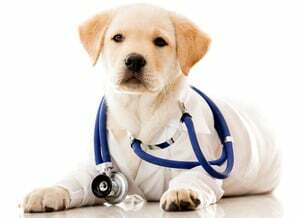 * we have listed cost of pet insurance per dog breed and it was calculated in April 2018 for an one year old male desexed pooch, accident and Illness cover. Annual benefit limit was $12,000 with zero excess. The owner was 24 years old living in postcode – 3000. There’s no perfect dog breed. Choosing a dog breed is like choosing a mate. You’ll love the great personalities and learn to live with the rest. That’s common. What matters is having a green light check on factors and traits that you want in a dog. We looked into many factors, and we believe there are 6 factors that stand up to determine the type of dog breed that you want. In fact, lots of dog owners and breeders swear on these factors. Let’s dive right in. Ask yourself these questions?… Do you have time for the dog? How much time will you allocate to this dog every day? Or, do you have people at home that will look after the dog while you’re away? Each these dogs will need time and attention. Let’s look at the characteristics of each group. If left alone, these dogs get into trouble or cause a distraction. Perfect if you have hobbies for them like hiking, Flyball and etc. The age of the dog matters a lot. Do you want a puppy or are you comfortable having an adult dog? Either way, you have to understand what is involved. Delicate and vulnerable, if you’re not watching them, accidents can happen. 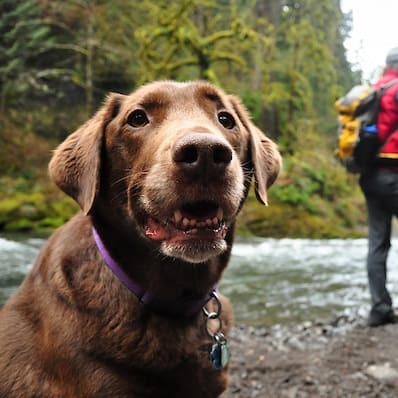 Two things you need to consider when choosing the size of a dog: Height and weight. If you are comfortable with a dog that sits on your lap while you watch TV, then you need a small dog. Like or not, grooming is something that you need to be prepared to do it. 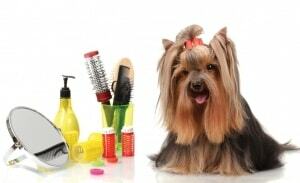 You need to have the right grooming equipments and tools for washing and cleaning your dog. Every dog breed has its own grooming routines. There are some breeds where you’ll have to clean them after two weeks. For others, you need to do it at the end of the month. Comprehensive cover: It covers both accidents only and accident and illness cover. The big difference here is that it comes with more annual benefit to help you cover more vet bills. The last and most important is having a family that is ready to live with a new dog. Your family needs to corporate so that the dog can feel loved and cared. Nothing hurts like a dog that loves only a few members of the family. For instance, when dog fight happens, each one should be in a position to end the fight. Or at least, do something to separate the dogs. Obedience plays a great role too. If the dog is treated well, it will listen and obey every member of the family. It is risky having a dog that listens to one person and disobey other people. This creates enmity which is not cool. Finally, consider whether there are any breed restrictions in your area. Pit Bulls, Akitas, Chow Chows, and Doberman Pinschers are all breeds that are commonly banned in apartment complexes and public areas. Be sure to double check any restrictions before bringing home a dog. Ready To Choose A Dog Breed? 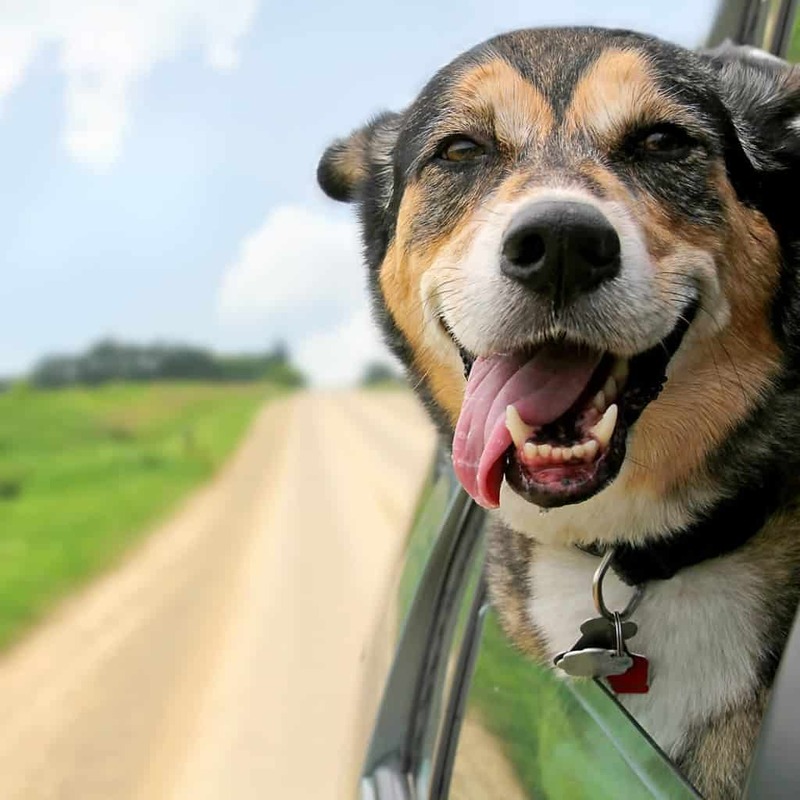 Now, you’re ready to choose a pooch from this dog breeds list. Most importantly, now you have the 6 checklist that you can use to narrow down on the best breeds for you. Keep in mind that, you won’t find a perfect dog breed. All you need is to learn how to adapt to other aspects that you don’t like. It’s like marriage, you don’t always have to agree with your partner, but you get along quite well. That’s the mindset and attitude you need to have. Dogs have a great personality once you fall in love and understands them. The key question to ask yourself, is whether you’ll do whatever it takes to make her or him feel comfortable and loved.